This website will not be maintained. In March 2015 I moved to the Information Access group at CWI. My new website is here. In Talk of Europe (ToE) we translate the proceedings of the meetings of the European Parliament (europarl) to Linked Data. 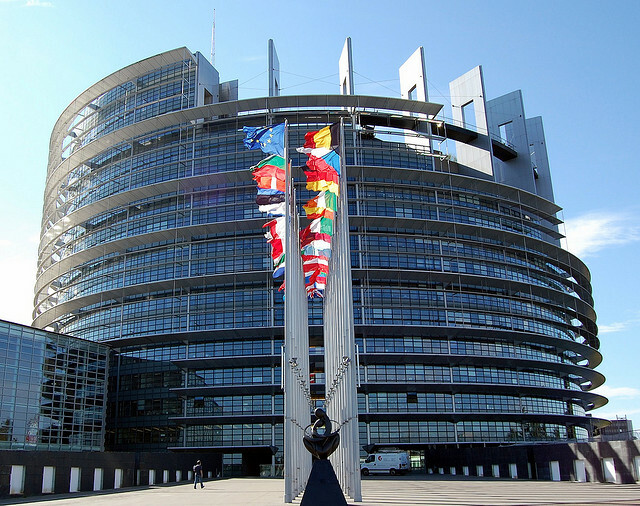 Our aim is to support a quantitative, longitudinal analysis of the EU parliamentary debates. ToE is a collaboration between VU University Amsterdam, the Erasmus University Rotterdam, DANS and the Netherlands Institute for Sound and Vision, and is a follow-up of the PoliMedia project in which these partners collaborated previously. It is funded by CLARIN ERIC and CLARIN-NL, made possible with support from NWO and OCW. How do different media-outlets cover political news? The PoliMedia project aims to showcase the potential of cross-media analysis for research in the humanities, by curating automatically detected semantic links between data sets of different media types. Update: Polimedia won the LinkedUp Veni Competition! Try our demo at Polimedia.nl or read our paper. Update: Polimedia featured in an article by Ewoud Sanders in the Dutch newspaper NRC about searching through public digital collections. The Second World War is a defining event in our recent history. A huge amount of digital material has become available to study it, ranging from newspapers published during and after the war, books about the war and, more recently, Web pages about people, places and events that played a role. Each source has a different perspective on what happened, depending on the medium, time and location of publication. In this project we aim to quantify these different perspectives. For this purpose, we employ a data science pipeline for selection, structuring, linking and visualization of WOIIrelated material from NIOD, the National Library of the Netherlands, and Wikipedia. With the data and visualization tools we produce, we provide insight into the volume, selection and depth of WOIIrelated topics across different media, times and locations. For more info on this student assistant project funded by the Data Science Research Centre Amsterdam, see their seed project page. I will be involved in the Netwerk Institute Academy Assistant project Political discourse in the news, together with Wouter van Atteveldt and Antske Fokkens. The project, starting in September 2014, will focus on NLP techniques to analyze and compare political debates and news. We are looking for motivated student assistants with a Bachelor degree in computer science or linguistics. Does the relation between political logic and media logic shift over time? In the ShiftPol project Laura Hollink, Wouter van Atteveldt (VUA Faculty of Social Sciences) and three student assistants work on this question, building on the results of the PoliMedia project and the AMCAT toolkit. This project aims to explain when proposals lead to debate in the media and how debates in the media lead to proposals by politicians. Two student assistants were funded by the Network institute of VUA to collect data from parliamentary debates and news archives related to seven key events in the public debate about pension reforms to answer this question. See also our website. See also the project website. In 2009/2010 I was involved in the AGORA: Semantics of History project, funded by the NWO Catch program and the Camera Institute at the VU University Amsterdam. Untill April 2010 I have been working in the MUNCH project (Multimedia Analysis of Cultural Heritage), funded by the NWO Catch program. MUNCH is a cooperation between the VU, the UvA and the Dutch Institute for Sound and Vision. We aim to improve search possibilities in the rich collection of Dutch television broadcasts that is archived at 'Sound and Vision', by combining three research directions: structured background knowledge in the form of ontologies or thesauri, language technologies and content-based image retrieval. Untill early 2006 I participated in the Multimedian E-Culture project. I recommend everyone to play around with the E-Culture Web Demonstrator, which has won the Semantic Web Challenge 2006. From January 2002 until April 2006 I worked as a PhD student in the IOP funded project Interactive Disclosure of Multimedia, Information and Knowledge, or ImIk (Interactieve Ontsluiting van Multimedia Informatie en kennis). On the 16th of November 2006 I defended my PhD thesis, titled Semantic annotation for retrieval of visual resources [PDF].